Is Your Marketing a Wolf in Sheep's Clothing? Is Your Marketing a Wolf in Sheep’s Clothing? Last week, I wrote that social media stunts can do more harm than good, because they set an expectation among the masses that they will also be treated with extraordinary kindness. But they won’t, because highly individualized “wow” moments aren’t typically scalable. Just three days later, I found an amazing article in USA Today about Sprint sending 470,000 hand-written thank you notes to their customers. Wow! They have implemented “thank you Thursdays” where each employee is asked to write five notes. Even the CEO writes them. Sprint has been doing some great stuff in the customer care area, including their Social Ninjas program. Check out the always good Hobson & Holtz Report podcast with Shel Holtz and Neville Hobson for details on the Ninjas. Humanization – The hand-written thank you card is going extinct like Kristen Stewart’s reputation. Scalable – 470,000 notes is not a “buy Peter Shankman a steak” or “give a kid a boogie board” one-off stunt. ……but then the milk of inspired kindness and human connection turned sour and craven. Thank You. Now Give Us Your Money. 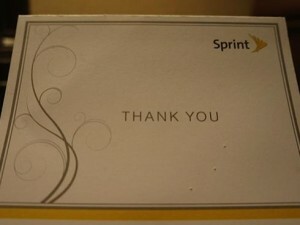 Turns out, each thank you note is “redeemable” by its recipient for 25% any accessory at a local Sprint store. There’s even an expiration date. This is a wolf in sheep’s clothing, and Sprint totally missed the point. We’ll never know of course, but I think they’d have a better redemption rate if they just sent the note without the offer, and then sent a straightforward offer down the road a few weeks. The unbastardized sheep makes the audience more receptive to the wolf. Or maybe I’m being oversensitive?